I have two books on my desk that are nice to look through. One is on compact houses and the other is on affordable homes. Unfortunately they do not say how compact or how affordable they are, but they give a nice idea of how spaces can be arranged and common materials can be used in a more interesting way. They will be on my desk until next tuesday. This home designed by Jun Igarashi Architects Inc. of Japan is a small home that utilized the concept of a loft to organize the space. It is a seemingly small home (approx. 1,000 – 1,200 sq ft, not much is written about the house) that is able to encompass all the necesities of modern living in an open, un-inhibiting space. Its exterior is wrapped in a translucent material (unknown) that gives off a soft glow at night, much like a lantern, and allows the space to flood with light in the daytime. The unusual feature of this home is that there are almost no walls, instead the architect treated spaces that needed enclosure, such as the mechanical space, as volumes slotted into the main space which allowed that volume to act as a partition. This one, built by students from U of I in Urbana, Champaign, is currently open for visitors at the Center for Green Technology at 445 North Sacramento Boulevard in Chicago. This is a PowerPoint Presentation titled “The Power of the Sun” that a team, including myself, completed for a course on Global Warming. It pertains primarily to solar energy and how we can use it; as well as looking at a case study home in Idaho that is completely energy independent. After looking at this we take a look at your average single family home and compare costs. We also briefly address other types of renewable energies, such as wind and geothermal power. housing for those who would otherwise have very few options. Many of their materials were salvaged from previous buildings or post industrial use. For example, one house uses leftover carpet remnants staked on top of each other essentially creating a highly insulative “masonry” wall. Another project uses dozens of car windshields as rain screen for a chapel and community center. There are two books in the GRC on Rural Studio and Auburns official site can be found here. 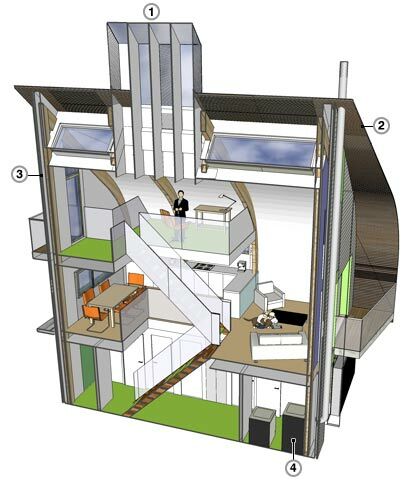 The Kingspan Off-Site’s Lighthouse design is an example of a zero-emissions home design in the UK that was unveiled in 2007. It utilizes (1) a wind catcher for summer ventilation, (2) photovoltaic panels for hot water and electricity, (3) a high level of wall insulation, and (4) a biomass boiler. The house would cost about 40% more than an average house of the same size, but will save tremendously in operating costs, which will over-time cancel out the initial pricetag.